The book is here, or two-thirds here. We’re still waiting on the iBook publication, but that could happen any moment. After some mailing list adventures – can you believe that Earthlink mistook me for a spammer? Me? – I think pretty much everyone I’ve ever met knows about the book. But perhaps there are some people who YOU know, super fans of the movie, who’d appreciate a thoughtful Groundhog Day gift. Amazon and Barnes and Noble both allow you to do this with the push of a button. I once wrote a blog about the Gift of Groundhog Day, but now there’s an actual gift idea for you. Hey, I’m trying to help you out. Don’t be caught giftless! And thanks for spreading the word! Naming the movie Groundhog Day was easy. All I had to do was to choose a day for the character to endlessly repeat from the 366 available (yes, I considered leap year); but once I chose February 2nd the title to the movie somehow, I don’t know, just came to me. And now I have a new book coming out! The title for that book just came to me, too. But then so did another one, and yet another one. I asked my friends and family to help me choose from my short list of titles, but you know, when you ask creative people for solutions they don’t choose from a list – they add to it. And it keeps getting bigger. It’s about writing Groundhog Day. I’ve used the original first draft screenplay – FINALLY available here, folks – as a roadmap to comment on everything from where the idea originated to why scripts in Hollywood are never shot as written, including, quite appropriately, this one. Along the way I’ve sprinkled plenty of background trivia (Why “I Got You, Babe”? ); myth-busting (Where’s the Gypsy curse? ); and true tales from crazy Hollywood – such as how I only wrote this script because I was fired from a job at Disney Animation that I had never been hired for. Publication is not far off and none of it will happen until I choose a title. I made it so you can vote on your favorite titles, and if you want you can add your own better title ideas because I know you’re thinking of one right now. Eventually I will use one of them – maybe yours. Yeah, I don’t remember, either. Hey, look! It’s Groundhog Day! No, folks, this isn’t some new dementia – just the same old one. Not that I forgot to tend the blog-garden; I’ve just had other things on my plate. Good things. Don’t worry about me. But you have my apologies for stepping out. I’ve missed you, too. Still, the sensation of losing my place, losing my train of thought, of suddenly waking up as if for the first time is very familiar to me. You too? It’s like the opposite of deja vu. It’s a feeling of “I’ve NEVER been here before” – even though I must have because, well, here I am, so clearly I was here a second ago. “So, where was I?” That’s me all over, my train of thought derailed, and the tracks that got me here somehow invisible. I recently told my students that it made sense to me that they would naturally write in a manner consistent with who they are. For example, if they are fearless, they will write fearlessly – perhaps easily beginning a scene without knowing where it is going to end up. If they are cautious, they will write cautiously – perhaps making an outline before setting out to write the script. How they write depends on who they are. That probably is true for me as well. So, where was I? The mental issue. Right. My issue is not about losing track of time – it’s bigger than that. It has something to do with losing track of context. How is everything connected? What connects people to motivation to emotion to logic to place to time? Which bonds are strong and which are weak? Life has been confusing to me for a long time. All of my new ideas – including contextual information – pass through my short-term memory, which is like a bulletin board with no thumbtacks. The ideas only stick to the board when I hold them there myself, but take a hand off the board to reach for another idea… Gone. And I’ve only got two hands, folks, and a lot of ideas. While I’m writing I find it necessary to re-discover or re-invent context constantly. In order to hang on to all of the moving parts of a scene I require lots of repetition: reading the scene over and over and over, repeatedly watching a mental video as I try to grasp context and hang onto it, all the while nudging and revising the scene bit by bit. By the way, to the best of my recollection, my memory has not degenerated, thanks for asking. This is me. I remember a high school pal telling me, “Danny, if you ever get senile nobody is going to know the difference.” That pretty much describes it. In this way I construct the life I want to live in and write the movies I want see. And someday – one hopes – you may see them, too. So there you have it – my poor memory is my curse, but it is also my superpower. I live with it and I write with it. And that is how you’ll find me, on this Groundhog Day or any other: sincerely enjoying your company while I try to figure out how I know you, and doing similar detective work on my characters, trying to figure out who they are and why they’re here and how it’s all somehow connected. Unique among the plants and animals – or so we believe – humans are able to concern themselves with life’s meaning. Over the years many (people) have shared with me the meaning they have found in Groundhog Day. The most recent example brought to my attention concerns the clock-radio at Phil Connors’ bedside, the radio alarm predictably going off every morning at six a.m. The display shows “6:00”. A rabbi who enjoys the film saw this number as “600”, representing the age of Noah at the time of the big flood. This would reflect the great cataclysm flooding through Phil’s life, washing away the sins of his past. On the final morning of Phil’s movie-life the clock switches to “6:01”, signifying the time after the flood when the rainbow appears and the world begins anew. I really like that one. Did I intend it? Not me. Did Harold Ramis intend it? I don’t think so. Feel free to ask him. But it doesn’t really matter, does it? Finding meaning isn’t the same as finding the facts – different people can find different meaning from the same experience, and who is to say that one person’s meaning doesn’t count just because someone else’s is different? What is clear to me is that with awareness, imagination, and commitment, it is possible to find meaning pretty much anywhere you look. One of the presentations included some amazing wildlife cinematography assembled into the Discovery Channel series called “Life.” The “stories” of various predator/prey relationships were told, such as the “story” of a baby ibex eluding a hungry fox, or the “story” of three cheetahs working together to bring down an ostrich. I wasn’t looking for meaning in any of this, but the mind wanders. I’m in the middle of planning new exercises for my screenwriting classes and began to ponder the differences between animal stories and human stories. I wondered, do all human stories have some basic structure that is drawn from the animal kingdom? Could imagining a human story that has no animal precedent be a clue to distinguishing what makes us human? I shared this idea with a typical group of co-conferees – a medical animator, a computer musician, a dot-com creator – and somebody asked for an example of a movie that was uniquely human. 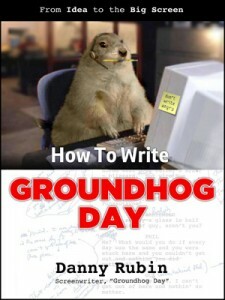 Having an encyclopedic knowledge of all movies ever made (ha) I thought of my movie, Groundhog Day. I suppose that all animals face each day as if it is the only one, taking their needs, desires and challenges as they come. Just like Phil they could on this particular repeating day encounter available food (sponge cake at the diner); a predator to avoid (Ned Ryerson); a potential mate to seduce (Rita). To whatever extent that this species of animal has memory, it could potentially adapt its behavior to know where the food is and be confident of its location; to know the habits of the predator and learn how to avoid him; and even to try to seduce the mate with repeated efforts. Certainly some animals in the wild, like us, learn through the experience of repeating days. What, then, is different about Phil’s experience? Beyond his animal needs, Phil has an existential one. Why even live a life? What do you choose to do on any given day? Why choose one thing over another? What is life’s MEANING? I think any zoo animal is living in Groundhog Day. Eventually some of them become lethargic, sedentary, and I think it’s fair to say bored and depressed, just as Phil did. But can they ever grow beyond that? My instinct tells me, “no.” This is perhaps one example of where humans and animals part ways. Phil’s development and growth seemed in many ways to be a response to his need to understand his own existence, explore its facets and limits, and to discover for himself its meaning. When looking for examples of human endeavor that are un-paralleled in the wild, each of us in this discussion at the E.G. took a look at our own professions. My brother, for instance, is particularly good at making connections between people and ideas. Do animals do that? Was there a cheetah responsible for introducing the other cheetahs to each other as likely hunting buddies? “Entrepreneurs of the Animal Kingdom.” That’s one Discovery Channel documentary I’d like to see. In the opening scene to Monty Python’s Meaning of Life several goldfish greet each other, then, with nothing left to say, begin to ponder the universe. “What’s it all about?” they ask. By showing us what fish wouldn’t do it helps highlight something distinctly human. Perhaps my writing exercises drawn from the animal kingdom will elicit similar insight from my students on the unique nature of humanity – whether it’s the capacity to search for meaning, or the ability and compulsion to tell stories.